Dimensions 1.50 by 7.75 by 8.75 in. The Art of Flower Arranging | Everyday Flowers | Paula Pryke's Flower School | The Flower Workshop | Weddings Flowers | Simple Flower Arranging | Flowers, Flowers! 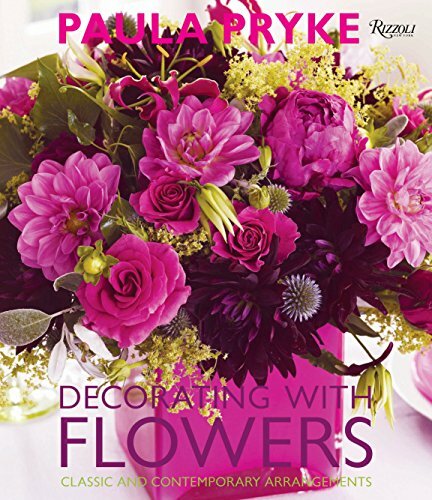 Amazon.com description: Product Description: The best of Paula Prykeâs classic and contemporary floral arrangementsâin an accessible format to inspire novice and expert alike. Paula Pryke, Britainâs acclaimed master floral designer and author of numerous bestselling books, is unsurpassed in creating floral objets dâart. Essentially a form of interior decoration or stage setting, Prykeâs floral designs are the key to beautifying the home, creating interior moods, and setting the tone for entertaining, parties, and memorable events throughout the year. Included are her signature clean, contemporary designs as well as romantic, old-fashioned bouquets with a modern sense of color and form. Prykeâs floral artistry goes beyond the traditional arrangement-in-a-vaseâher signature concepts include using nontraditional containers, unexpected accessories (e.g., candles or fruit), combining unusual colors, textures, and architectural forms, as well as other decorative touches such as wreaths, garlands, and even decorative dog collars. Packed with ideas, skills, and techniques, this book explores the latest trends in floral design for any season and encourages readers to let their creativity and personal style flow with step-by-step instructions. Gorgeously illustrated, this compilation is an invaluable catalogue of ideas and inspirations. About: The best of Paula Pryke’s classic and contemporary floral arrangements—in an accessible format to inspire novice and expert alike.